Wednesday October 18 - general, Thursday October 19 - Tape Team. Just how can we get him serious? Robert Garner cajoled me into helping him clean and tidy up the work bench. Maybe knee pads are in order? And Chuck Kantman "helping" Frank King on the 084 sorter. 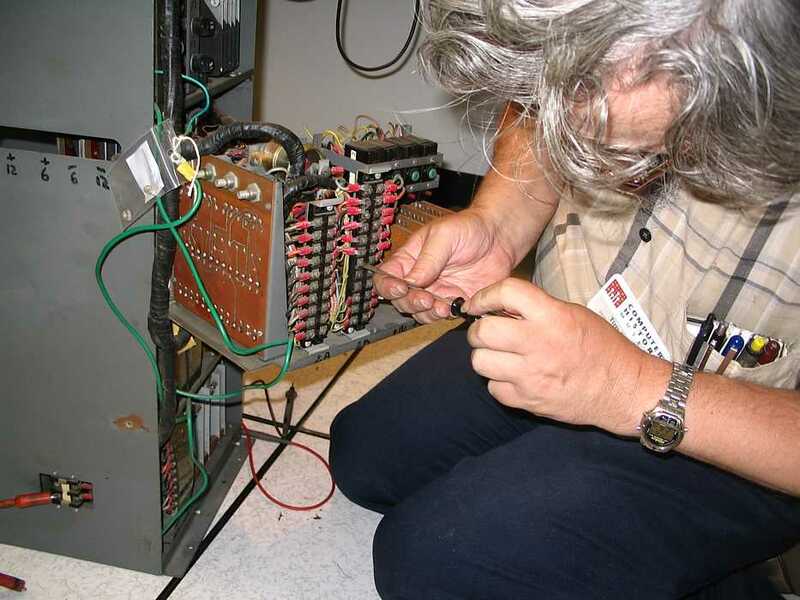 Ron Crane is trying to locate a likely leaky pass power transistor in the +12 volt 729 tape unit power supply that I reported. And trying to get the suspect transistor out without further disassembling this power supply subassembly. And what is this thing trying to tell us? Or is it trying to keep a secret? 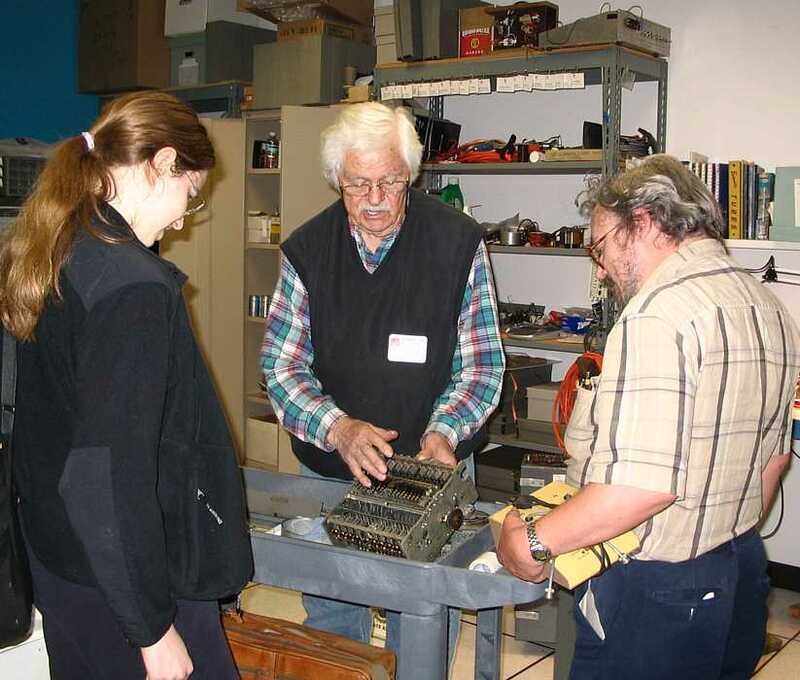 Bob Erickson and Glenn Lea worked to further stabilize the 077 collator. It can correctly compare and pocket several thousand cards with out a misstep. Ron is aware of a temperature-dependent problem in the 1401's instruction control logic that may also be the problem you saw--there appears to be a glitch in the IE0 control signal. It first popped up two weeks ago. Unfortunately, it seems to go away after about 10-15 minutes. Nonetheless, it would be very interesting to build a "universal SMS card tester". But the CTDL CG__ CY__ cards, with their U and T levels, are not the same type that are used in the 1620, so maybe two separate testers makes more sense. I do think that getting the 1401 CPU up to real solid with good cards would allow us to use it with confidence as a "test set" to shake out all the other peripherals. So, Ron Crane, what sort of ideas did you have in mind for an SMS tester? In the meantime, I wonder if some freeze spray judiciously applied would help track down the temperature-dependent card(s)? Actually the S levels (used in both the 1401 and 1620) and U levels (used in the 1401) are identical. So if it supports U levels it supports S levels. Present were Glenn Lea, Bob Erickson, Ron Williams, Frank King, Don Cull, Bill Flora, Ed Thelen. Jeff Stutzman came in for an hour during his noon time break. Ed started on another power supply that had already failed testing - +12 and +6 volts each put out 1.3 volts. Bob Erickson looked very spiffy in his Australian OutBack hat ;-)) His wife is from Australia and they visits Australia every few years - Bob says his hat is the RealThing. Bob and Glenn continued working and perfecting the 077 collator. They seemed mostly smiles. Bill Flora, Frank King, Ron Williams continued working on the 1402 card reading section. Tried to write to the tape from the cpu - If more than 1 character output, the controller gets confused and continues rewriting the same character forever - off the end of the tape. Ron Crane came as a member of the Marconi Society, which rented the CHM. - He and John Toole escorted many well dressed, prosperous appearing people to/through the 1401 area. The new batch of diagnostic decks has arrived. We now have tests for Multiply, Divide, complex branching, Tape Operations, and other more complex functions. I prepared the decks for use. Each deck is labeled and they are stored in the card shelves that face away from the 1401. We could not try any of them because the 1402 card reader was unable to read. The timing seems to be off. We executed a Tape Write instruction from 1401 memory. The instruction is designed to transfer a record of data starting from a designated address and ending when it reaches a location containing a "group mark with a word mark". We found that the first character was transferred correctly, but subsequent characters did not transfer. Instead the first character was infinitely repeated. We also tried to write a record where the first character was a "group mark with a word mark". This caused the Tape Write operation to immediately terminate. Note that writing "null records" like this is supported by the 1401, but it showed that the 1401 can detect the terminating character. Run and a gate 01B2 (I think this was the gate. It is the one that contains the I/Ex switch logic.) is disturbed. Run and you try to debug something else. We were unable to isolate the root cause during this session. Present were Ron Williams, Bob Erickson, Tim Coslet, Ed Thelen. 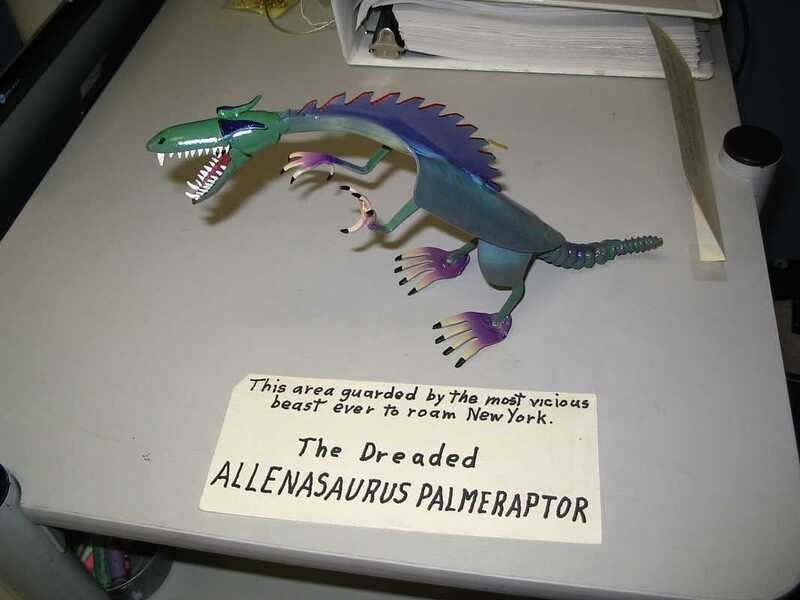 An ancestor of Allen Palmer?? 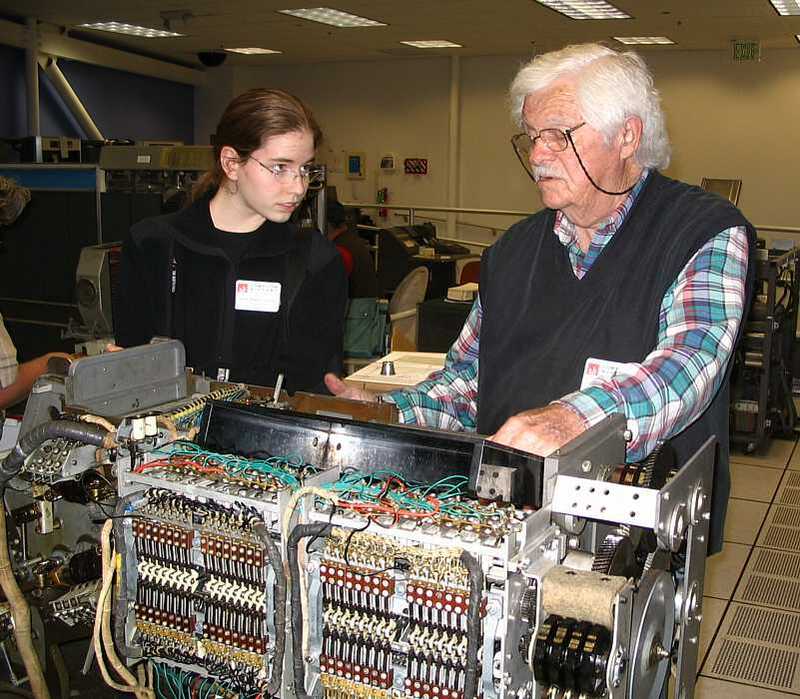 Bob Erickson exercized the 077 collator. Since it can't look for prime numbers nor compute pi, he had to settle for sequencing his test deck of about a thousand cards, sequentially numbered, with a diagonal line on the back. The machine seems stable now, again - maybe repeated care will improve its stability? Ron Williams reports that the card reader is still sick. The 1401 seemed to perform all instructions correctly. "Morning sickness" was not evident today. 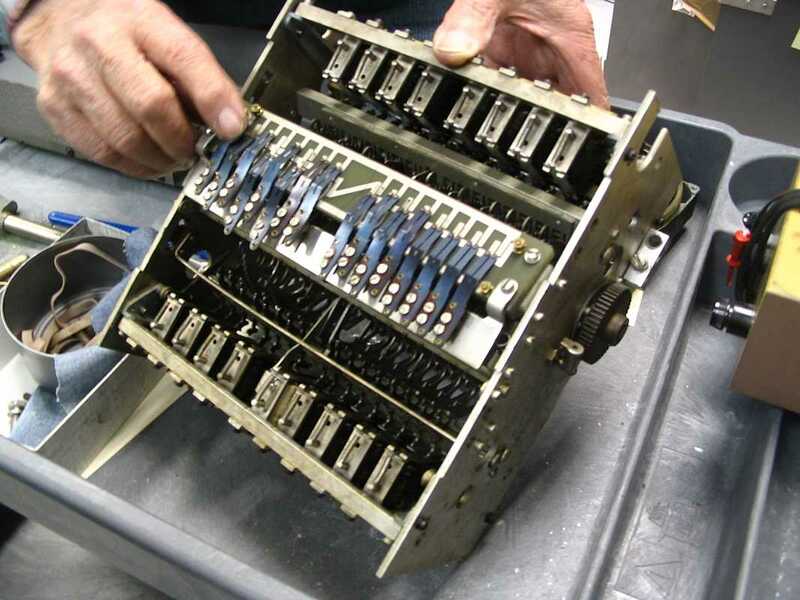 Ed Thelen and Tim Coslet worked on the power supply for the xxx062 tape unit. 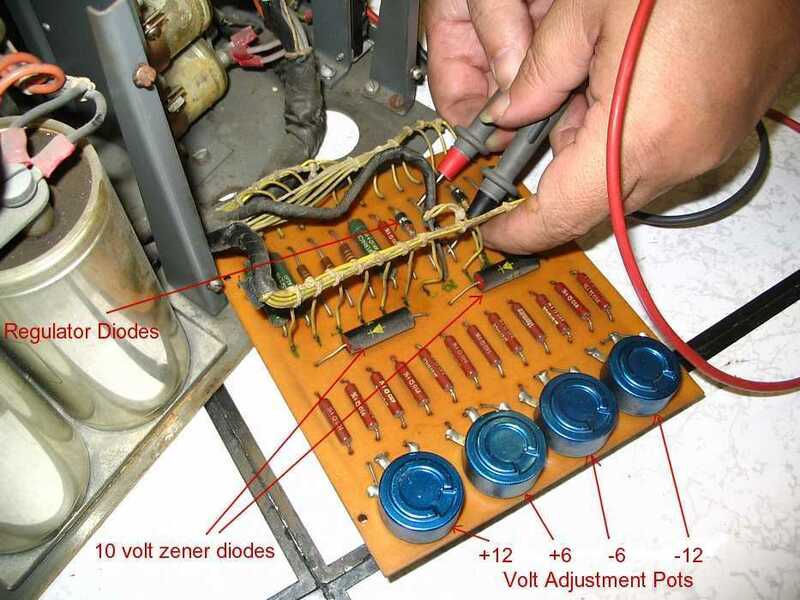 Removing the cabling prior to removing the +12, +6, -6, -12 volt regulator subassembly - could be called the level 2 subassembly, the bottom unit could be called the level 4 subassembly. This is where the transformer supplying the regulators and regulated power supplies on level 2 was housed. 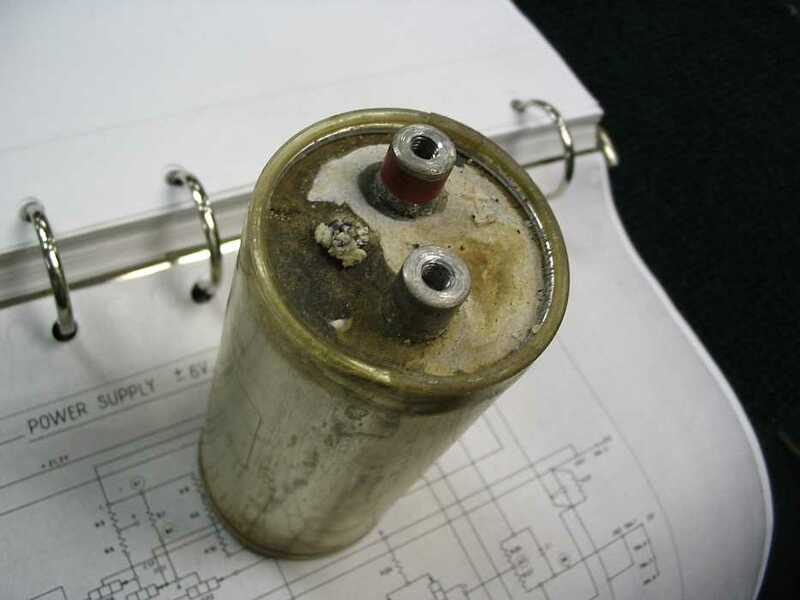 Tim says that this power supply showed evidence of multiple field repairs. 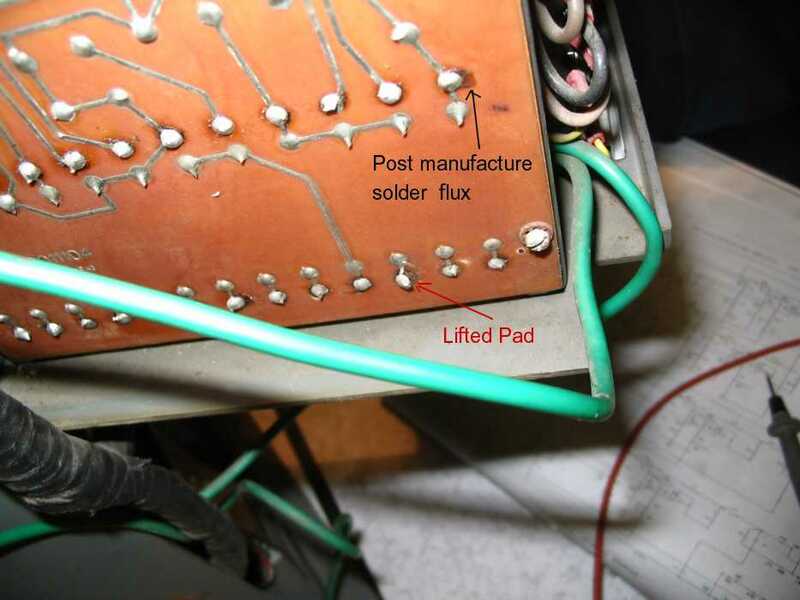 Here is a lifted pad, and solder flux. a jumper wire from the transformer (on subassembly level 4) was not connected to the other diode (on level 2) of what should have been a full wave rectifier. We did not have a suitable diode - and time ran out. As we were about to leave, Julie, a CHM volunteer came into the 1401 room - and got captured. She listened with seeming interest as we tried to wow her with 50 year old technology. Bob Erickson is showing Julie and Tim (and me) the secrets of how this electromechanical 077 collator compares numeric fields between two cards. These slide switches are controlled by ratchets and magnetic pawls on the other side of this 16 digit comparitor. The switches on this side slide up or down - and the sequence can emit a greater than, equal to, and less than - electrical signal to be used by the control panel wiring. Present were - gosh it been 8 hours since and I totally forget - Ron Williams, Bob Erickson, Bill Flora, Don Cull, Glen Lea, Robert Garner and ?me? - this senility is just killing me!! John Van Gardner wants to remind us of this story of curing "morning sickness". I used to do the same by making sure "my" GE-225 would work (run diagnostics correctly) while raising and lowering the customer's air conditioning temperature and running voltage margins :-)) Sometimes I would do a vibration test by running a pen across the edges of the cards in the various racks. Tuesday I was at CHM, and saw two visitors being turned away as this was not a visiting day. As I was early for the meeting, I volunteered to show them about. Mr. and Mrs. Schneider (Schneider.Noerdlingen@T-onLine.de) were from Germany and Mr. Schneider had worked for IBM (in the business side) in Sindelfingen, Germany. I suggested they might interested in "our" IBM 1401 system from Germany - and they definitely were. They were unaware of the unadvertised private IBM museum in Sindelfingen - and were very interested in the contact info I provided. Bill Flora and crew noticed a gear on the read side of the 1402 behaving strangely, and removed it and its bearings. The bearings were very hard to rotate. People apparently read this web site - when I arrived Wednesday, after getting some power diodes from Fry's, I was greeted with these diodes provided by one or two anonymous folks. The +6 and +12 voltages still did not work !! Checking further I found that wires leading into terminal strips on subassembly #4 (the bottom one) were unscrewed, and these were needed to power the repaired circuits on subassembly #2. Am I being too paranoid suspecting that there had been an attempt to fix this power supply, and that the attempt was abandoned before being completed? - but it was time to leave - next time. Bob Feretich and Ron Williams were in. While shopping with my wife I dropped in - just as they had run test 5000 - card to tape test - with one error. They repeated it for me - and got 4 errors. I left before things got worse. Early in the day, the 1401 exhibited intermittent instruction execution problems. The problems seemed to be sensitized by tape operations, but they would occur during normal instructions. The error typically started occurring in an unconditional branch after a tape operation. Once it started occurring, it would sometimes also occur during simple load and branch loops (no tape ops). The error is an erroneous switch from state I1 to Ex in the branch instruction. (In the branch the I-cycles should have proceeded to I4 before the branch. As a result, the branch address is not fully loaded in the I-STAR before it is taken. Of course, as soon as we thought we were closing in on the bug, it stopped occurring! We ran the "Tape-to-Card" (5000) diagnostic deck several times. We usually received one to four errors per run. (The errors seemed to be random, rather than data or position dependent.) This means that we are mis-writing about one in twenty tape records. Since the 729 drive that we are using has never gone through fine tuning adjustments, this error rate seems reasonable. Allen: We should get together and make the drive adjustments. When is a good time for you? Note that the " Tape-to-Card" diagnostic does not try to read the records it writes to tape. It just checks for TAU errors after the Tape Write instructions. However, "write data" is read back into the TAU and VRC checked as part of the Tape Write instruction. Also, we could see the data appearing in the Tape Channel Analyzer LEDs. We then tried the "Move Tape" (5030?) diagnostic. The "Move Tape" diagnostic writes tape records, backspaces, then reads the record it wrote. This diagnostic failed on every record. It seemed that the Tape instructions would run correctly, but the data read from the tape would not make it back into memory. All records were to be read as blanks. The 1402 was able to read in the diagnostic decks, but multiple "Reader Checks" would occur on each deck. (About one every 20 cards.) The "Reader Checks" did not seem to effect the execution of the diagnostics. Most of the decks consisted of "data cards" and important information on the data cards was sparse. (mostly blanks) The diagnostic decks give the card reader's clutch a good workout. Our reasoning, "that the Ripple Read diagnostic clutch use was an anomaly", may not be valid. Present were Ron Williams, Bob Erickson, Bill Flora, Don Cull, Allen Palmer and Ed Thelen. Ron Crane arrived during lunch break - does that sound suspicious to you? But I did get a picture of a framed 5081 type card done up by Ron Williams. - cable termination questions, ?resolved? Ron Williams thinks the 729 was left in tape stretching mode? Ron Williams fixed the "morning sickness" bug that has been so irritating. The machine would go out of the instruction fetch phase and into the instruction execution phase at the wrong time. When asked about the broken wire in the 1406 core memory stack, Ron says that Bob Feretich and Ron Crane (who found the broken wire) could fix it when the 1401 is not needed to help debug other devices for an extended interval. - Maybe they could fix it some day when no one else is there? Bob Erickson continued applying TLC (Tender Loving Care) to the 077 collator. Ron Williams punched out some more test decks for further 077 tests. Ron Crane measured its capacitance as 1/300 of its label rating. Ed replaced that capacitor, replaced the wires that someone had disconnected - making the power to the zener diodes to be now fullwave, fired up the power supply, and all voltages were now correct or correctly adjustable. Ron Crane and Ed tested the 729 power supply under load, and all was fine. We tagged it OK and turned it over to Allen Palmer. Two more (of the original five 729 power supplies) to go.